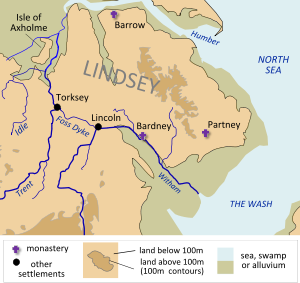 That there was indeed an early Anglo-Saxon kingdom of Lindsey is now generally accepted. In confirmation of its existence might be cited a number of items, including that we have a genealogy of its kings in the eighth-century Anglian Collection; a reference to it as a tribute-giving polity in the seventh-century list known as the Tribal Hidage, where it is assessed at the same level as the kingdoms of Essex and Sussex; a description of it as a prouincia by Bede, his normal term for an Anglo-Saxon kingdom; and the names of a number of its bishops from the mid-seventh century onwards. What is less usually recognized, however, is that the attested seventh-century Anglo-Saxon kingdom of Lindsey was itself, to some degree, a development of an earlier British kingdom. The following discussion therefore has several aims. The first is to present and analyse the linguistic, historical, literary and archaeological evidence which supports the above contention. The second is to attempt a synthesis of this data in order that conclusions about the likely course of events in Lindsey in the fifth and sixth centuries can be drawn. The third and final aim is to begin to assess the lasting historical significance of this post-Roman British kingdom, through an examination of both the situation in seventh-century Lindsey and indications in later texts that this British background to Lindsey was not been entirely forgotten.